Between 800-1100 CE, the Vikings traveled everywhere -- eastwards as far as the Middle East as traders, and westwards into the North Atlantic on unimaginable voyages of exploration. 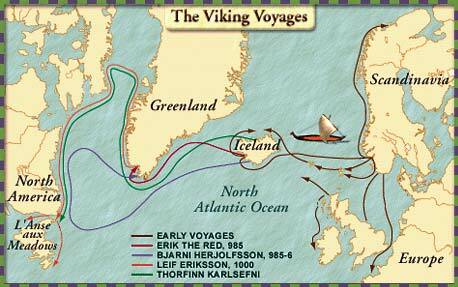 Here is a map of their voyages across the north Atlantic. In 1965, archeologists discovered conclusive proof that the Vikings arrived 500 years before Columbus. They found the ancient Viking settlement at Newfoundland. Leif Erikson's site Vinland was identified with a Viking settlement, discovered and excavated at L'Anse aux Meadows in Newfoundland. Reconstructed sod houses at L'Anse aux Meadows settlement in northern Newfoundland. It was settled briefly by small groups of Norse from Iceland and Greenland ca. 1000 CE. The Northern climate was harsh. The L'Anse aux Meadows settlement lasted only two years. The last Viking settler in Greenland died in 1540. And the whole Viking culture disappeared in the 12th century when both the Vikings and Scandinavia were converted to Christianity.